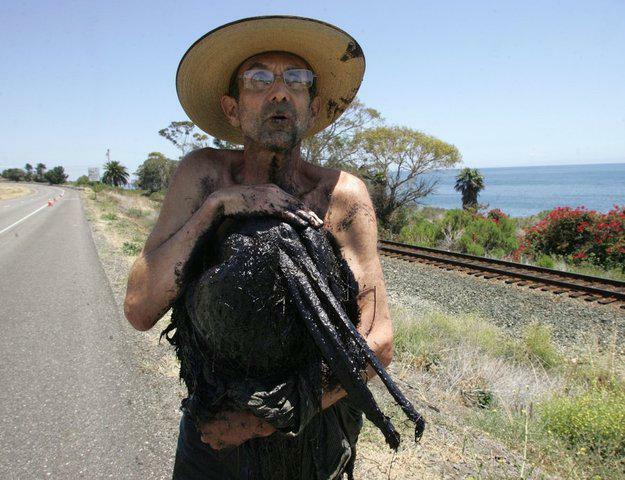 Crews are working around the clock to clean up the site of an oil spill in Santa Barbara County that has sent tens of thousands of crude into the Pacific Ocean and left even more saturating the soil. 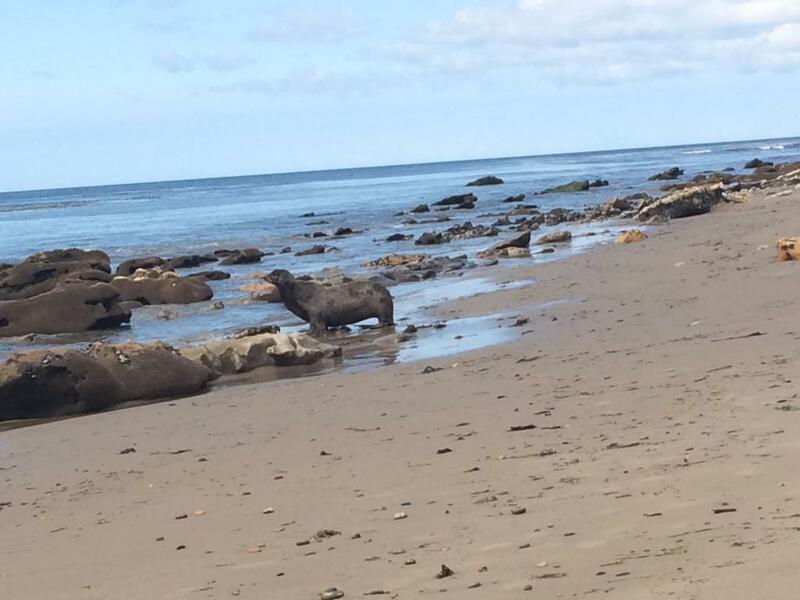 About 100 feet from where the rupture occurred, a sea lion raised its oil-covered head to the sky and collapsed on the beach. 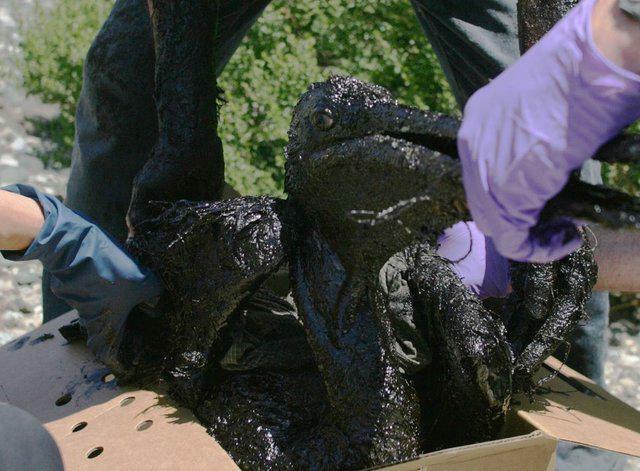 It rested its head on a rock and rolled onto its back, exposing a shiny, oil-stained belly. UC Santa Barbara marine sciences doctoral student Anna James stopped collecting water samples and looked over at the struggling animal. "That poor sea lion really puts it all into perspective," she said. Sea lions normally run off when humans are near, she said. The sea lion was too tired to move. 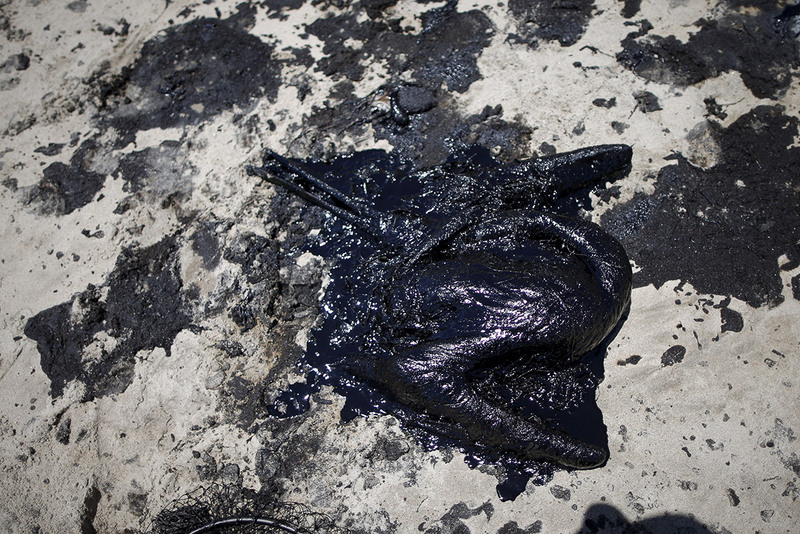 The sea lion, which appeared to be female, wallowed in the sand just below a rocky cliffside covered almost entirely in black oil. 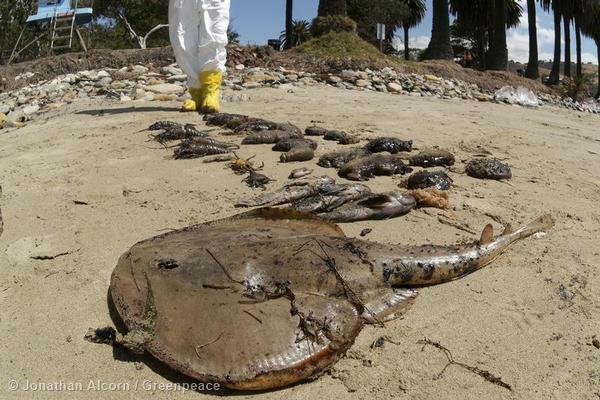 Marine mammals and fish are turning up on shore both dead and alive. A pair of cleanup workers in protective suits walked up the beach with nets and boxes. 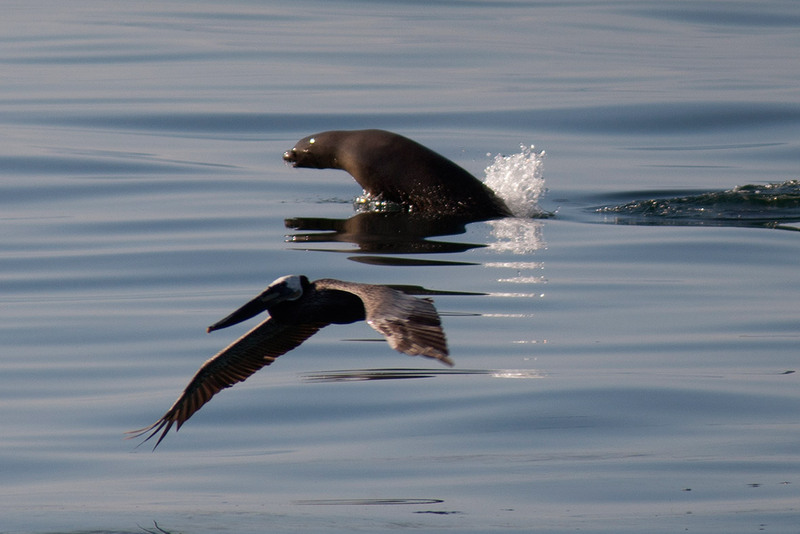 They were ready to capture and clean birds, not sea lions. 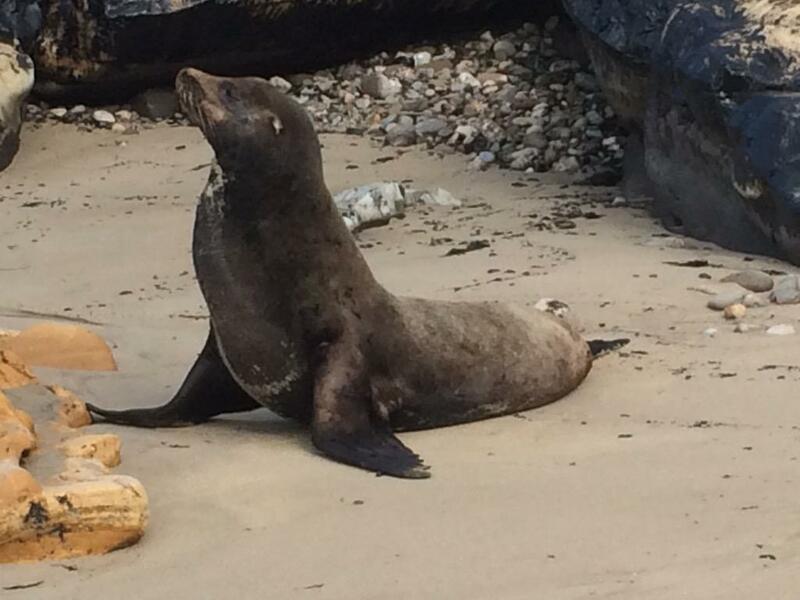 California Department of Fish and Wildlife Environmental scientist Colleen Young stopped several yards short of the sea lion and scribbled down notes. She said they would have to wait for a special team trained to deal with sea lions. Just then, the sea lion rose up on its oil-stained flippers and began shuffling to the water. It went into the surf and disappeared into the water. Young said that even though it was not good for the sea lion to be back in the polluted water, it does not necessarily spell disaster for the animal. The sea lion's blubber will protect it and provide warmth, she said, unlike a sea otter that can suffer with oil in its fur. "Sea lions can cope with it quite a bit better than sea otters," she said. 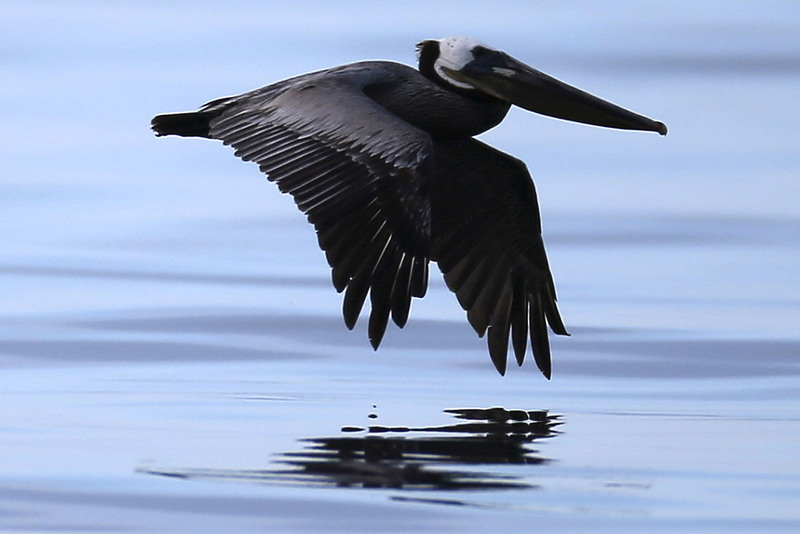 With all of the perils and risks involved in living in the littoral, there is, as in all natural communities, a marvelous balance of success and failure. Take success to mean the ability of the individual to reproduce itself and the species to continue. 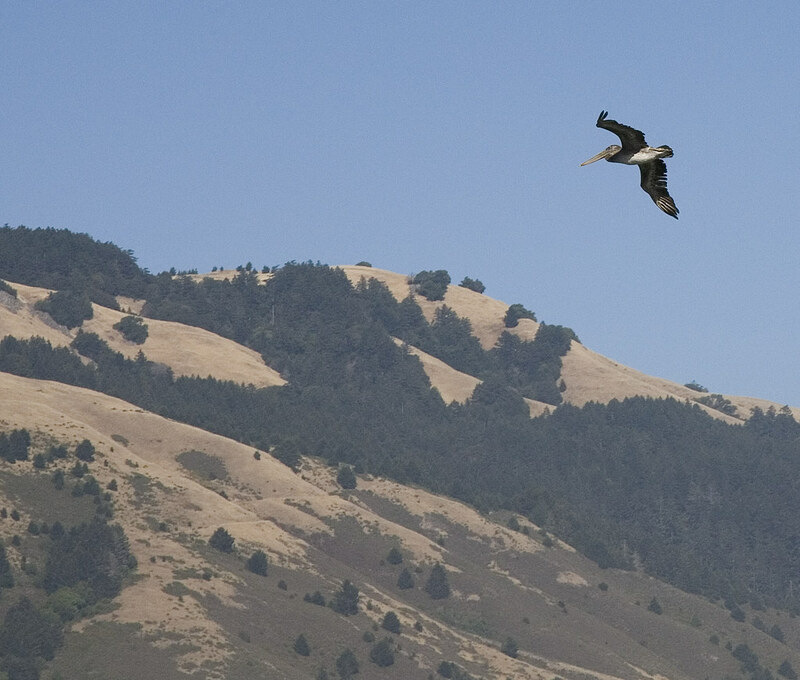 California shares, with other shore-fronting lands, the oldest natural communities on earth. Life which we assume to have begun in ancient seas has changed less in this environment than any other. We look back a hundred million years when we investigate tidal rocks and shores. is immobile but still pulsating a little. spread before us like a desolate tune. From the greatness of their element they all take beauty. It slides into a cloud over Point Lobos. Every day for four years I visited the spot where this nine-mile spill now lies upon the waters. A paradise, more or less. That such a place, with such an abundant diversity of life, should ever have been gifted upon humans, is almost impossible to believe. What the humans have done with, and to it, is perhaps tragic -- though of course all that abundance of life doesn't understand drama. But it is learning more and more about loss. The massive peckerwood pipeline company that caused the spill says all its operations have been "within industry standards". Right, the industry of death, cars, freeways, business as usual, the human legacy to the future. This country is a truly beautiful country. But a pity the people are so ugly. L'Enfant, the new techno elite classes that dominate every part of this country not dominated by rightwing Christian moronism agree on one common and implicit axiom: the car is king, and anything required to keep its tank full of petrol is not only desirable but "necessary"; this includes not only the casual and accelerating sacrifice of all nonhuman animal species but the slower, more gradual extinction of the species at the pinnacle of the new Great Chain of Being: Homo Sapiens, also identifiable as Homo Necans, Man the Killer. Given the choice between a full tank of gas and a full spectrum of animal life, the American automatically chooses (the brainless expression "no brainer" covers this quite well) the former. Some might wonder whether the oceans, the skies and the earth itself should be plundered and poisoned and exploited in this aggressive, mindless way, particularly as these Americans are so uncurably indulgent and fond and protective of their precious "kids" (that is, little replicas of themselves), whose future they are in such a rush to cancel. But no one in Texas would wonder this, and as water, earth and sky are increasingly sold off to the highest bidder, "Texas rules" (drill, pump, frack) automatically win out, even if the gross profits in Houston are shared neither with the fauna and flora nor with the mindless and insouciant two-footed predator at the top of the decision chain in California (also known as "the taxpayer"). 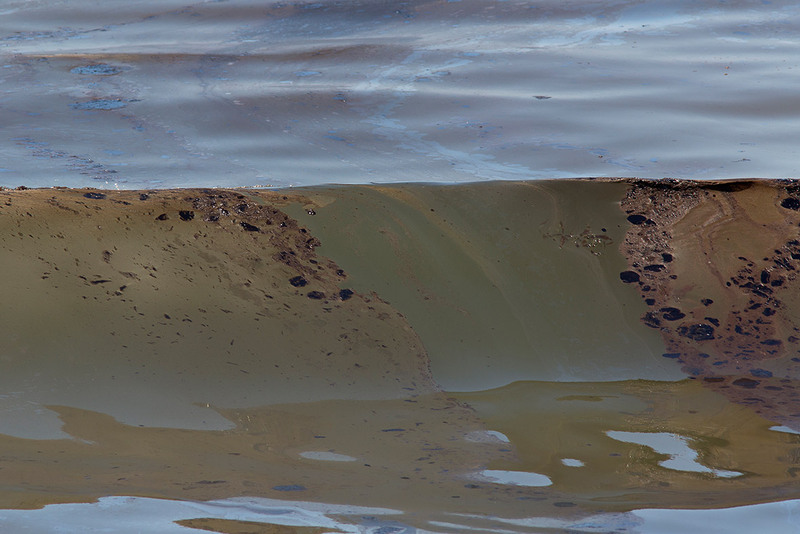 Some might wonder, why lease rights to tap and pump oil from a marine sanctuary to a company with a long and ugly record of environmentally disastrous "accidents"? Do take a close look at the graphic showing the massive reach of this company's "assets" and you'll see the whole history of today's America del Norte writ large, stretching from the "tar sands" obscenity in Alberta (oh, those "superior" Canadians are actually in greater haste even than the Yankees when it comes to selling off their environment) to the filthy cesspool which is the Gulf of Mexico. Those guys have got the whole continent covered, and are continuing to foul it up forever, even as these futile keystrokes are wasted. 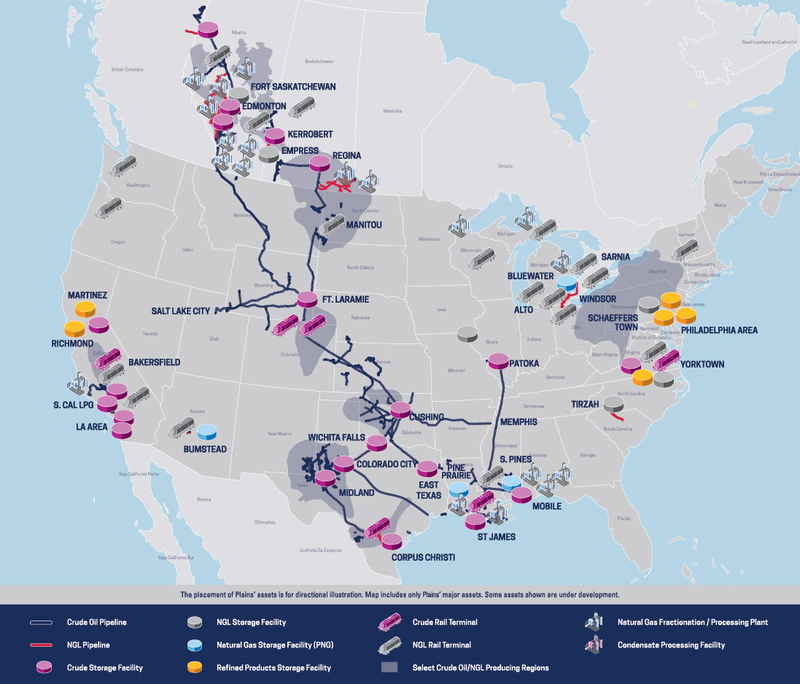 But anybody who wants to get to the "bottom line" (apt expression invented by the same brilliantly and triumphally suicidal "culture" that invented "time is money") ought to check out the stock market trajectory of Plains All American Pipeline shares over the past 72 hours or so. But of course nobody will want to bother to do that, unless they are "trading" in the "market". And to the vast relief of the "market", after an initial slight wobble, PAA shares bounced right back up. Score one more for Wall Street, where this country's real deals are done, and where nobody would know or (of course) care about the difference between a mussel and a muscle. Unless they were in a restaurant. K, the ugliness is in the soul, not the body, and it fairly shines out, like luminous mud. The "beautiful" (cosmetic artifact) people, the "iconic" movie and pop culture glamour stars, possess, to this ancient, jaded eye, all the beauty of a pool of axle grease under a parked "energy efficient" (!) motor vehicle. The most beautiful people I've seen lately are those stateless, suffering, forgotten Rohingya. Their beauty shines out from an occluded soul. Yet it has and sheds a light. Some years back, when I was still able to get around on foot, my nightly course took me past the world-famous high-end eatery "Chez Panisse". Out front there would be, routinely, rows of fancy limos parked and waiting. Wealthy Asian tourists would be packed in front of the "iconic" entrance, snapping pictures of themselves and each other, as a prelude to entering, being served, and photographing microscopic portions of exquisite gourmet delicacies, commoditized before being consumed. Less wealthy Americans, unable to drop hundreds of dollars on a single meal, would commonly be packed in small huddles before the day's menu, posted in a glass case before the entrance. Often, again, one would see pictures being snapped. This is religion, as practised here. It was also customary to see Americans of considerable clout and magnitude -- governor, senators, media and businessworld supermoney heros and heroines, the objects of the envy of all -- trailing in and out of the same fancy joint. If America has cathedrals, this would be one. If America has worship, it would be on display here. In mid of night, the rows of trash bins outside the place would always be stuffed to overflowing with the leavings of the greedy rich. Emptied and dumped as garbage by dawn. And too, one would often see private ambulances outside the place. One evening, curious, I enquired of an ambulance attendant, and learned that the puffy (yet of course "distinguished"-looking) middle-aged white man, who could be seen sitting up inside the ambulance, was in fact, "okay". "No big deal," said the attendant. "He just ate and drank too much. Happens all the time. His wife will take him home. He'll be fine in the morning." Always a bright new day, another profitable deal to do. It's strange you say that about the Rohingya, Tom..I was thinking the same thing when I saw that photo of a beautiful and charming young girl you posted. Of course there's a danger of romanticizing, but got the same impression looking at Thesiger's pictures of people who lived under extremely harsh conditions (i.e. in his 'Visions of a Nomad'). K, the wonderful Thesiger, who lived to be 93, never ceased hating cars and aeroplanes, traveled the Empty Quarter and the empty quarters, on foot, by camel, on horseback, after the manner of the indigenes, whose trust he won, and whose ways he brought us closer to than anyone else from "out in the world" would ever do. I do see that resemblance, and have myself for some nights been thinking about those Rohingya girls, in their finery, amid hellish circumstance. Their beauty suggests an inner fire, an indomitable life that may have to do with youth, but finally seems to have more to do with courage. Here is one young woman Thesiger photographed while traveling in the Barir Valley of Pakistan in August or September of 1952. "Once we passed a dozen camels tended by a woman with two small children. Al Auf said, 'Let's get a drink', and we rode over to them. He jumped from his camel, greeted the woman, a wizened old thing bundled up in black cloth turned green with age, took the bowl which she handed him, and went towards the camels. She shrilled at her sons, 'Hurry! Hurry! Fetch the red one. Fetch the two-year-old. God take you, child! Hurry! Fetch the red one. Fetch the two-year-old. Welcome! Welcome! Welcome to the guests!' Al Auf handed us the bowl and in turn we squatted down to drink, for no Arab drinks standing, while the old woman asked us where we were going. We answered that we were going to fight for the Al bu Falah and she exclaimed, 'God give you a victory!'" Alas it seems the the relentless quest of the moneybags for oil is a monomania exercised in the face of unimaginable catastrophe, Black Swan events clustering on the Deepwater Horizon to fill up all the little time that remains to the living with viscous horrors. The O'B administration now blithely proposes to drill not only in the remoteness of the Arctic but in the nearness-to-you of pretty much the whole Atlantic seaboard. We already have this. The major refineries up the road are constantly "flaring" and "releasing", just to keep our nerves on edge. The "street" we live on is a lethal speedway. Seven people on this block have been killed by cars in our time here. I came a half pint or so of blood away from being #8, and though I will never again place myself behind the wheel of a motor vehicle, and in fact haven't done so in nearly a half century now, I'll never again walk or stand without pain, thanks to cars. The stench of emissions hangs heavy in the air at rush hour, which begins at about 7 in the morning and doesn't taper off until about 8 at night, if then. Drivers take this nightmare as SOP and spend hours on the freeway every day, as though fate required it. 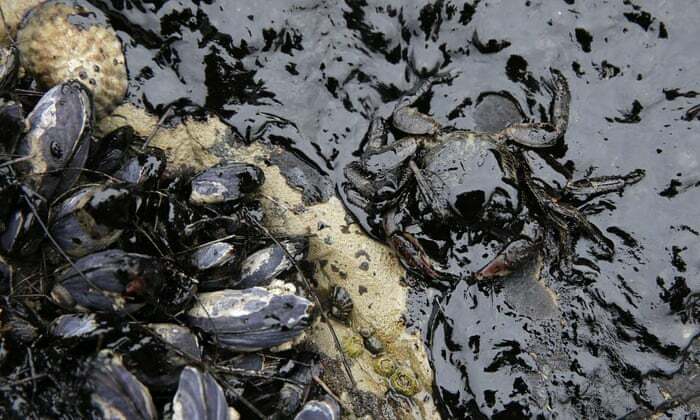 The pipeline pirates who have fouled one of the most beautiful coastlines on earth are "facing" some negligible fine. I believe the top limit on federal fines is about half a million dollars. To a company of this dimensions, that wrist-slap wouldn't even be felt. Meanwhile, Plains All American has put out a statement, saying, unbelievably, they regret any "inconvenience" caused by their spill. Yes, I really love that picture as well (put it up somewhere on the blog). Thanks for sharing it! When you first mentioned your dislike of cars-when I first came here-I immediately thought of Thesiger. Old school! Your quote reminds me of a passage from Asad's 'Road to Mecca'. Will try and find it. A great book-until he becomes a Muslim! But the descriptions of the desert are up there with Exupery's. Tom, here is a young french poet talking (sorry for my poor english) : thank you for your poetical documentation of the way oil industries do murder our world. I am afraid that europeans are as "brain less" as american on the "car topic" - actually, those who understand the very simple idea that destroying the earth is destroying ourselves are to few to make a major change happen. On this topic, politics is our only salvation path and if poets can helps politics, lets all of us who believe in and write world's beauty make a move in this direction.